We all trust Microsoft Office with our most important documents, spreadsheets, E-mail and presentations since it allows users to set passwords for preventing their important Office files from opening or modifying etc. After we have learned how to easily set password for Excel, here I would like to share some knowledge about remove Excel password with you all if you think you have decided to enable others to view or edit your files or you just have got bored entering password or password again when opening files and then you can remove Excel file password to give them full access. To remove Excel worksheet password, if we know its password, then it turns quite easy to make it. Below are some ways to delete different types of Excel passwords. Method 1: Remove “Password to Open” or “Password to Modify” from “Save As”. Step1: After open the target spreadsheet the click the Microsoft Office button and then click “Save As” next. Step2: Click “Tools” and then click “General Options”. Step3: When the “General Options” window prompts, you will see the “Password to Open” or “Password to Modify” or even both of them with asterisk. All you need do is just to clear the asterisk. Next click “OK” and then save the settings and exit. Method 2: Remove “Protect Worksheet” or “Protect Workbook” from “Review” tab. Step1: Open the target spreadsheet and then click “Review” tab. Step2: Step2: Select “Unprotect Worksheet” or “Unprotect Workbook” option, next in the pop-up password box type the “Protect Worksheet” or “Protect Workbook” password. Then just click OK to end. Method 3: Remove all types of passwords when you forgot them with “Excel Password Recovery Professional” tool. This is a special case when you forgot the password for your Excel spreadsheet. Both method 1 and 2 require a password when removing it. While if the password is forgotten or lost, one should take some professional Excel Password Recovery tool to decrypt it. Related Article: How to Remove Excel Password after We accidently Lost it? How to Recover Excel File Password? Often it is necessary to set a strong password for your Excel file to prevent it from unauthorized modification or illegal Excel password recovery, especially for those that contain links to calculations in other areas of Excel or other confidential data. Due to the different online services and accounts available to us all, it is likely that you will forgot your Excel password if you are confused by the multitude of passwords. Losing those important workbooks which may contain your working table or school research data may suspend your projects. It must be annoying if you can’t retrieve it on time. Luckily, we found a useful utility which named Excel Password Recovery. It is developed for Excel users to recover lost or forgotten Excel files. Excel Password Recovery (don’t have? Go to download). Step 1: Launch Excel Password Recovery Tool. Step 2: Import the encrypted file into this program by simply clicking “Open” button. Step 3: Choose the attack type which fits you. Brute-force Attack can be selected if you can’t offer any clue about your password. However, compared with other two types, this one may take you more time. Brute-force with Mask Attack can be used on the condition that you can provide some password parameters such as length, character or character type it contains, and the character it begins with or ends with. Dictionary Attack is recommended because saves your time when you offer a dictionary file. If you don’t have, never mind, just use the default one that is contained in this program. Step 4: Choose the corresponding tab for settings based on the attack mode you choose in the previous step. And then set it. Step 5: Click “Start” and wait the process bar to reach 100%. After a while, your current password to open will be display in the popup. Step 6: Click “Remove all passwords from the file” to delete the password to open and the password to modify for your locked Excel. For Excel file with sensitive information, you have better create a new password which is easy-to-remember for you but hard-to-guess for others. In creating your new Excel password, it is ideal to choose a combination of words and numbers that are relevant to you. By using this technique, the security of your Excel file is high and you will not be able to forget the password. If you are really forgetful, you can choose to use this xlsx Password Remover. Microsoft Office Excel 2007 offers better file protection options to secure your workbook. You can easily encrypt, password protect and lock your files created using Microsoft Office Excel 2007. By setting a password, unauthorized users are prevented from opening or modifying the document without password. 1. It is highly recommend using a strong password. Strong passwords include a combination of upper and lower case letters, symbols and numbers. Step 1: Open the Excel 2007 file that you intend to encrypt, password protect and lock. Step 2: Click the “Office Tab” located in the top-left corner. Select “Prepare” from the list. Click the option to “Encrypt document”. Step 3: An “Encrypt Document” dialog box pops up with an option for you to set password. Enter a strong password. Click OK. Step 4: A confirm password dialog box pops up with an option for you to re-enter password and confirm it. Save your excel file. Step 5: Close the excel 2007 file. That is all! Wasn’t that easy to encrypt, password protect and lock files in Excel 2007. All the original articles are authorized by SmartKey, welcome To Transshipment but Please Retain the original. If you are interesting in Excel Password Recovery, please visit our website. where order seroquel in usa? Microsoft Office Excel program offers a password protect feature that allow MS Office users to lock a *.xls file in order to void unauthorized users from viewing or modifying. When you open an Excel spreadsheet but found that you have forgotten the password. You must be screwed. But I believe it won’t last long because there are a few ways to unlock a password-protected Excel document. WARNING: I offer this information only to gain access to your locked Excel spreadsheet. Do not use this technique to unlock excel file that is not yours. If the password is frequently used, try your best to guess the forgotten password, was the password tied to some common things in your life? Such as your name, birthday, pet name etc. if you are lucky enough, you may suddenly “remember” the password. There are lots of software available can be used to recover/remove the forgotten excel password. In order to offer you the best Excel Password Recovery software, I have tried all password recovery tools I can find, and according to my experience, I recommend you Excel Password Recovery 5.0, your best choice to unlock password protected Excel files. Excel Password Recovery is easy to install and easy to use. With Excel Password Retrieve Software you can instantly get back your password and get access to your workbook without any waiting around time. The guide below is a brief explanation on how to use Excel Password Recovery to unlock excel password. Then install the setup file. It comes with a trial so you can try before buy the DNBN. Step 2: Run the software, Click “Open” to browse the full path of the Excel into the program. Step 4: Click “Start” to start the password recovery process. Step 5: When it finished, you’ll see your password in the File Opening Password Box. Hope you find this trick useful and unlock Password Protected Excel Document as fast as possible! Microsoft Office Excel, a part of MS Office suit distributed by Microsoft for Microsoft Windows and Mac OS X, is a very popular spreadsheet application using by people all over the world. It helps us calculating and graphing. With Microsoft Excel application, Microsoft Office users can analyze and store important data securely. Many times while working on some very confidential data, to protect the information that we usually apply really complex combination of passwords which is not at all easy to remember, and due to burden of work certain times we forgot password of the excel file . What’s worse, our Excel worksheet containing some very important data is nearby and you have not ever saved your password anywhere as backup. If you’re stuck with an .xls file with a password that you have forgot and need to break or crack, at this point of time only Excel Password Cracker can help you cracking the password. This guide outlines how to use a simple Excel Password Recovery Application to crack a lost or forgotten Excel password, allowing you to unlock password-protected Microsoft Excel documents quickly as possible. To execute the following excel password retrieve steps, you’ll need to download the pro of excel cracker firstly. The available directly is here: how to recover Excel Password? Once you have downloaded this program on your computer, run the install exe file with the default options. Run the Excel Password Recovery program. Click the “Open” button on the top right, navigate to the protected spreadsheet file. In the Open File popup, select the file and click “Open”. As far as we know, password cracking is the process of recovering passwords from data that has been lost or forgotten. So when Excel Password Recovery tool begins the recovery process, it will repeatedly test different guesses for the password until one succeeds. Now you have known how it works, it is your turn to select an attack type that suits you mostly. If you didn’t remember any clue of the password, then you can select Brute-force attack, which will try all possible combinations. If you still remember part of the password, then choose Brute-force with Mask Attack, it will reduce the time of guess tests. If you remember the password is frequently used or you can provide a dictionary file, then select Dictionary attack, this attack is highly recommended as it offers a smarted password recovery process. If you choose the Brute-force with Mask Attack or Dictionary attack, then you have to do some settings according to your located password. Click the “Start” button on the bottom to begin the attack. This may take a long time according to the password complexity. When the attack finishes, your excel password will display on the “File Opening Password” windows. Use the provided password to open the secured Excel file, or click “Remove All Passwords from the File” if you want to remove both the password to open and password to edit the file, Click “OK” to finish the job. Recently I wrote an article about how to password protect Microsoft Office Excel 2003. After reading my article, many users wondered as they could recover a password protected excel 2003 file as they lost or forgot the excel password. I felt it necessary to write this How-To article for recovering a protected password in Excel 2003. Password protecting an excel file is no strange for us and it is useful if we share a computer with family, friends or colleagues and have to keep our data away form prying eye. If you have forgotten your password-protected Excel document password, then you must have a sinking face. If you urgently need access to the restricted excel data, then you probably have tried brute-force password hacking. That is to say: you have basically tried to guess what the password is and test different guess for the password until one succeeds. However, this may literally take thousands of years if you have used a complex password, sounds like it is impossible to recover the Excel password, but that does not necessarily mean that you have completely lost access to the password-protected Excel forever. Everything will be convenient if you do this job by a brute-force password recovery tool. Excel Password Recovery 5.0 will allow you to decrypt the password protected Excel file and salvage the data form it. This program is use to get instant access to password protected Excel document created in MS excel 97/2000/2003/2007/2010. And it provides three password attack modes to enhance its performance to crack the password they are brute-force attack, brute-force with mask attack and dictionary attack. Before recover a password protected Excel file, you should understand how did this three attacks work. Brute-force Attack: This attack mode will try all possible combinations until get the matched password and recover it. However, if the password is long and complex, it will do a long time of guess tests. So only using a small and simple will I recommend you to choose this mode. Brute-force with Mask Attack: If still remember part of you password, I’ll recommend you to select this attack mode, For example, if you remember your password is 6 characters and the first letter is “a”, then you can define the mask as “a??????”. It will reduce the time of guess tests. But the premise is a password mask must be defined, or you will never recover the password. Dictionary Attack: I highly recommend you to choose this attack mode, but you may feel strange about “Dictionary”. Then what is a dictionary, it is a text file, which can be simply regard as a library listing the password elements. If the password is frequently used, you can provide a dictionary file by listing your character sets to let the program base on when seeking the password, such as your name, birthday, pet name etc. If so, it’ll save your time to recover the password. So, just follow the simple step by step process below to easily recover excel password. Step 1: Download and install Excel Password Recovery program. Point your browser to here: how to recover Excel password? Step 3: Select the type of password attack which you think is the best way to unlock a Excel password. Step 4: Setting for the password attack mode what you choose. Step 5: Click “Start” to begin the attack. How long it takes is depend on the password length and complexity. When the password attack is successful, a window will pop up and show you the opening password in “File Opening Password“. 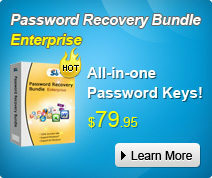 If you are interesting in Password Recovery Bundle, please visit our website.